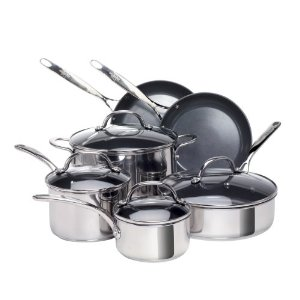 Both professional cooks and home chefs all love cooking with stainless steal cookware sets. Stainless Steel Cookware Sets range from inexpensive for lower end branda and higher priced for higher quality well known brands. Considering the fact that your stainless steel cookware will last a lifetime, you should go with the best quality you can afford. Inexpensive sets will not perform as well as a quality set. If you are looking for even heating and good sturdy stainless steel cookware that will not warp then choose a quality set like those by All-Clad or Calphalon. If you want to make sure you are buying a quality set of stainless steel cookware you can test it while shopping by placing a magnet on the bottom of a pot or pan. The cookware is low grade if the magnet sticks to the pot or pan. You should avoid buying any set like this. Stainless steel cookware sets are less expensive than purchasing non-stick cookware which will need to be replaced every few years. Stainless Steel Cookware Sets will not chip or rust. Stainless Steel Cookware Sets will not scratch. Sure non-stick pans are nice for awhile but soon they become scratched and begin to peel. Choosing a cookware set with a copper bottom will help improve even heating. Higher quality sets come with a lifetime warranty and riveted handles. You want to look for thick bottoms on pots and pans. Stainless Steel Cookware is easy to clean. Even stuck on foods come off easily by soaking the pan or pot in hot soapy water. Stainless Steel is non porous will not harbor bacteria. Stainless Steel pots and pans do not react to foods with high acidic values like foods with tomatoes. If you aren’t sure you want to commit to a stainless steel cookware set, you may want to purchase just one piece and give it a test drive. If you end up liking the piece then you can always go back and buy the entire set. 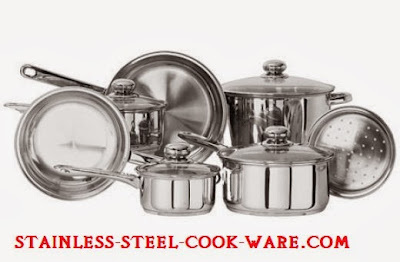 A great way to get a good deal on stainless steel cookware is to shop online. Online stores don’t have the over head retail stores do so they can offer better deals. Remember choosing a stainless steel cookware set is an investment which will last for many years to come and possibly a lifetime.